Yep. The light armor wearers get the best outfits. BUT.. I will get a bunch of Blake in his Town clothes/Formal Clothes/Adventuring Clothes/ and brand new Cold Weather clothes. Country Boots: Strawberry, Persephone, Strawberry. I love all the styles shown! It's really amazing how playing around with the colors can change a combination up. I really appreciate it, too, when someone is able to do something with the medium armor. 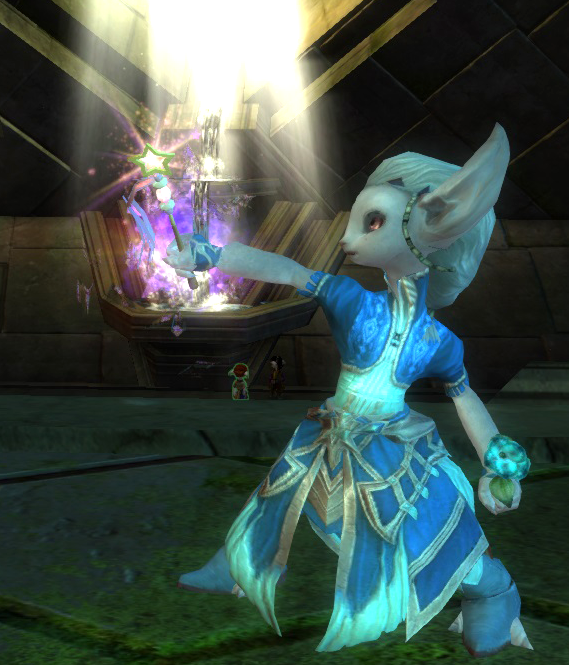 Also, I love the asura pictures and yay, we have some guys! 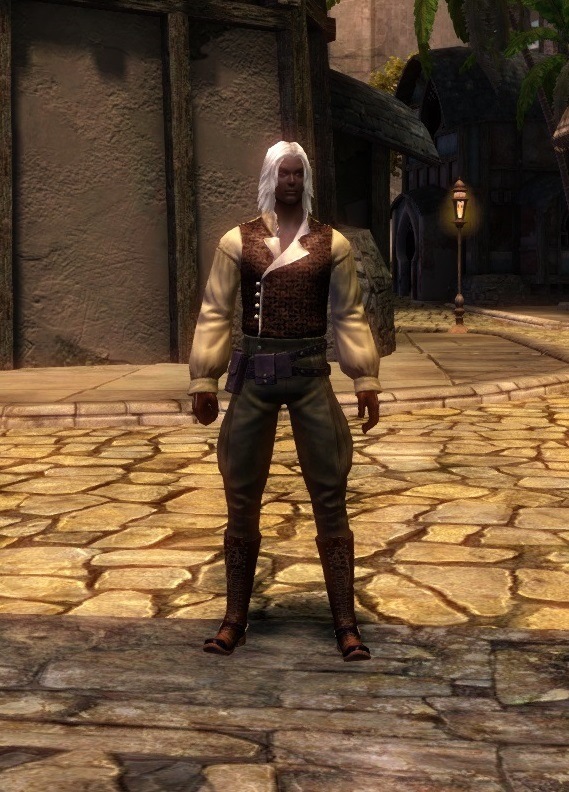 Here's hoping we can get more guys fashions - especially with medium armor. I know that can be tricky. Dandhi is a Vabbi-mix who ran away from her rich, merchant family to join the circus...so I try to keep these things in mind when figuring out what her personal style is. She likes bright colors and pastels. OK. I only have 6 outfits for Blake, and two of those are town clothes. 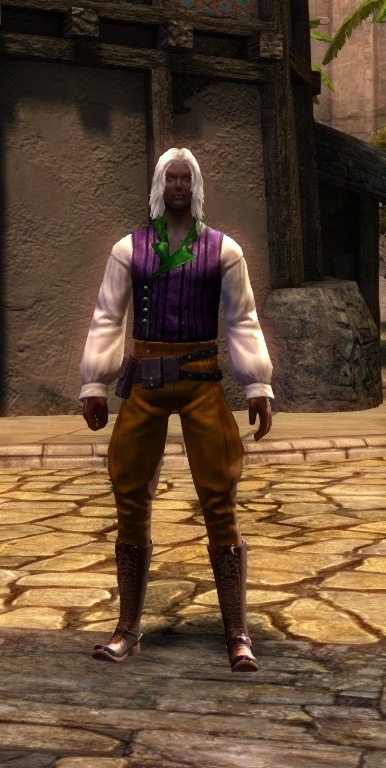 I treat his town clothes like a Foppish noble would, he has dozens of pairings, and tries to never wear the same shirt twice, if possible. So I'll post his most recent colorings. The other three are "Traveling Warmer climates" "Traveling Cold climates" "Formal Wear" and "Order of Whispers ritual clothing"
Riding boots - Midnight Red, Midnight Purple. 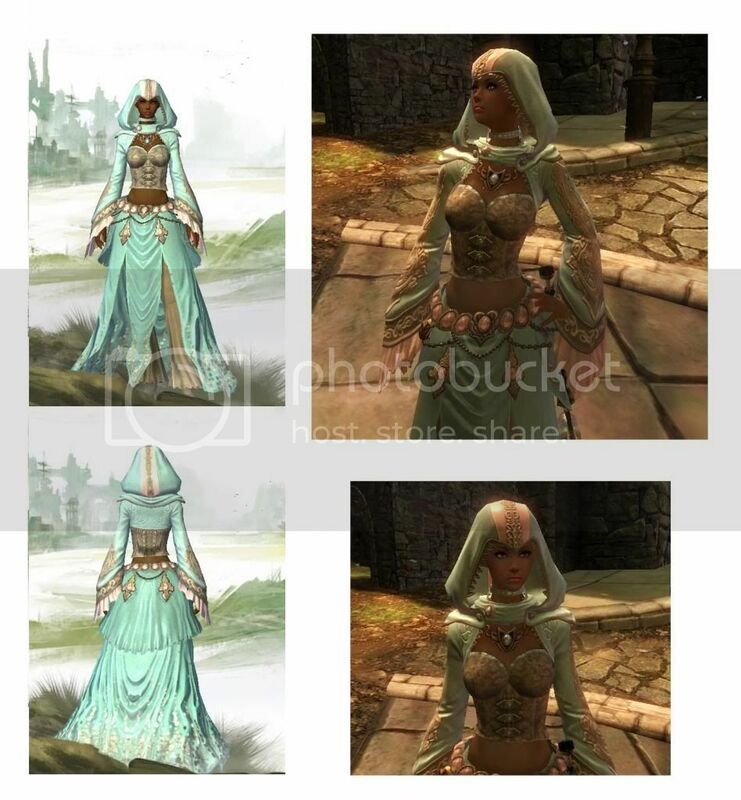 the riding boots and riding gloves are colored the same as the first picture. Pants, boots and gloves stay the same, colors adjusted to match. Aetherblade Gloves - Just make sure the hands are white, nothing else shows. Noble Boots - Midnight Red. Hope that gives guys and leather wearers some ideas on what can be done, with a few colors and some imagination. 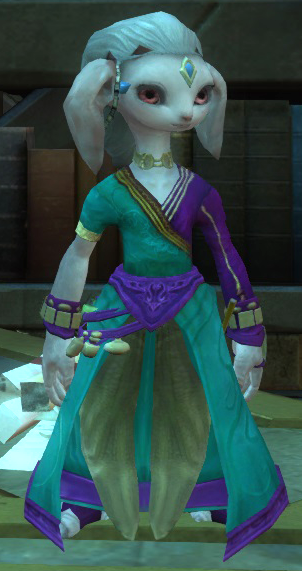 Cybele's outfit, which is basically OoW light chest and Arah light skirt. Shawl is Cabalist's Shoulders. I saw something similar in Lux's album. LOVE YOU FOR THAT. Love your outfits. And yes, it's photoshopped, but you get the idea. 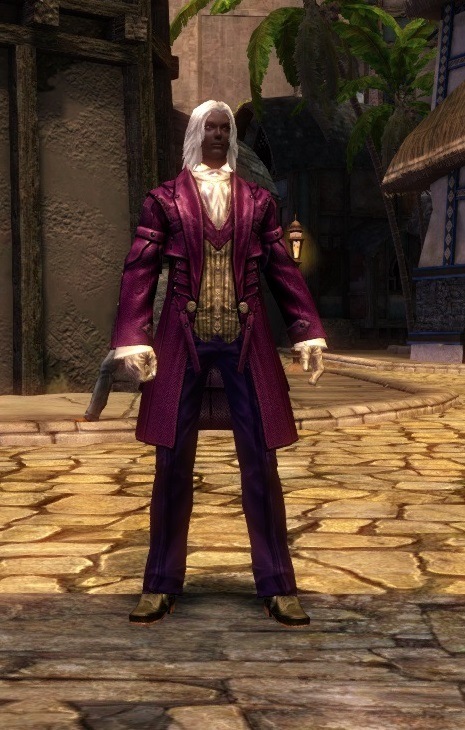 Here's another outfit for one of my characters. 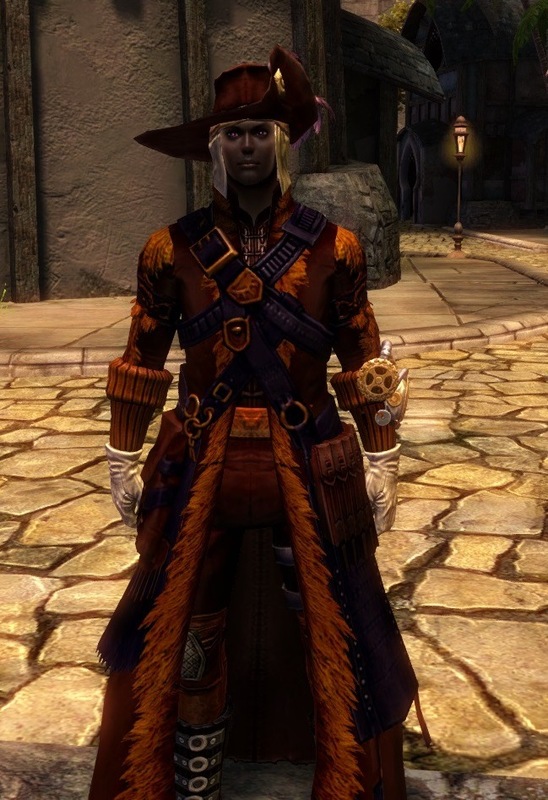 It's just all heavy Priory gear, but I like the dye job. I feel like a mix of blues and greys really makes the details of the armor stands out, and it reflects really beautifully in the light. 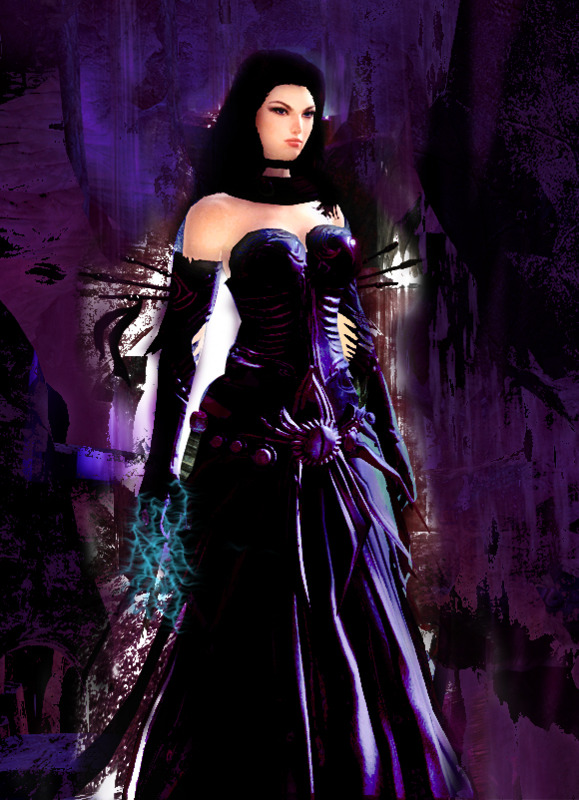 This was Cybele's previous outfit, a "swamp witch" set. 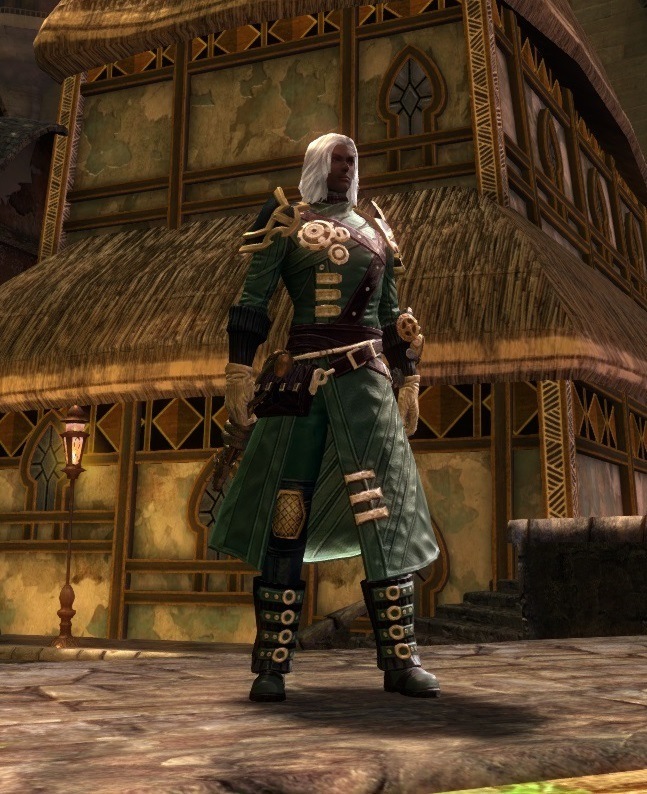 It's a mix of Masquerade and Tactical (you can get it from Orr Karma Vendors or WvW for Badges of Honour). Shoulders are Conjurer's. The next one I made for the lolz. 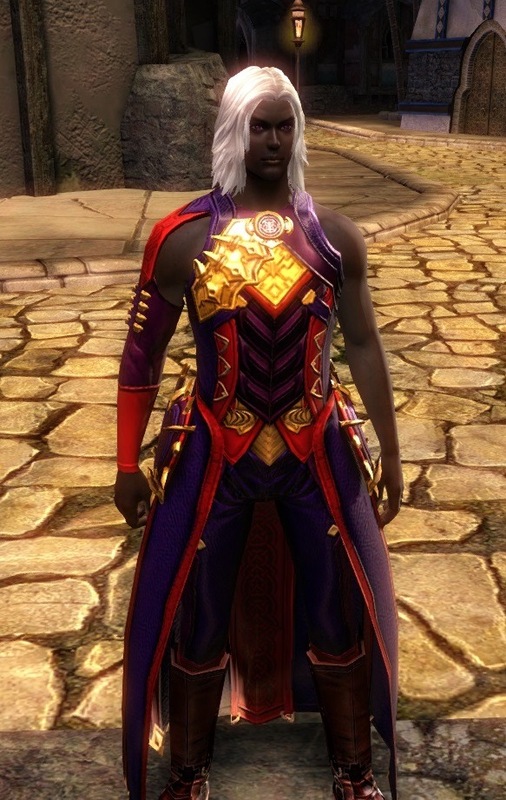 It's based on Final Fantasy's stereotypical Black Mage, on a thief. A variation with Human T1 coat. The last one is from a character I had months ago, who was a wizard. I don't have a very proper screenshot of him, but here he is. The head is obviously Winged, shoulders are heritage and the rest of his armour is Exalted. I gave him no gloves. For variation, I can also advise Cabalist's as legs. Just recently joined these forums and I always love threads like this.